Pink Ribbon Blues is pleased to republish the fourth essay about Komen’s financial situation by Anna Rachnel, titled “Komen By The Numbers: 2010 And Still No Answers.” The essay was first published on March 16, 2011 on her blog, The Cancer Culture Chronicles. Stewardship: the conducting, supervising, or managing of something; especially : the careful and responsible management of something entrusted to one’s care. In September 2010, Susan G. Komen for the Cure® (“Komen”), proudly announced they had received a four-star rating from Charity Navigator, a popular charity evaluator whose reports are accessible by the general public. This all sounds very nice, but what does all this really mean? In the case of Komen, the award of a four-star rating tells us that it is a highly-rated fiscally responsible and financially responsible organization. Not whether it lives up to its mission, aligns its programs and allocates funds to its mission, buries overhead within program budgets, uses evidence-based practices, etc. In essence, the ratings say nothing about how effective Komen has been in fulfilling its mission of “saving lives and ending breast cancer forever”. These are fair questions and should be part of any independent evaluation. To say that an organization is “efficient” and has “capacity” says absolutely nothing about whether an organization is doing right by its donors, nor the cause(s) it purports to aid. And it should. Although, if one bothers to read the methodology statements on Charity Navigator’s website, it states that a “..limitation to our ratings is that we do not currently evaluate the quality of the programs and services a charity provides.” This seems like a pretty important omission in the ratings system to me. So how “effective” is Komen? Given that breast cancer remains incurable; breast cancer mortality rates have remain unchanged in decades; early detection does not guarantee that anyone will avoid metastasis at any point after diagnosis; available treatments are of questionable efficacy; acceptable screening methods and their effectiveness are still being debated; and awareness and education programs have yet to prove that anyone can escape diagnosis in the first place, Komen’s “effectiveness” rating in my book would be not very. In judging “effectiveness” close attention should be paid to an organization’s financials, to see how it’s spending ties with it’s mission. In previous instalments of this series (Komen By The Numbers,The Context of Research, and Education In Focus) I have analyzed Komen’s financial statements to make my own judgements about how “effective” Komen has been in spending it’s precious resources. Komen recently released audited financial statements for the financial year ended March 31, 2010, and today I continue my evaluation of how Komen’s spends it’s donors funds. 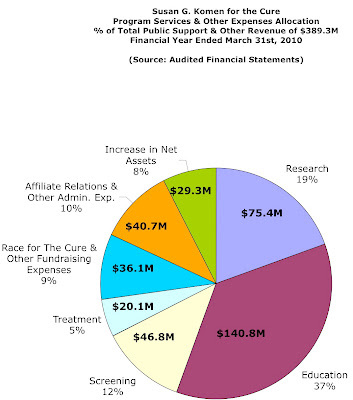 The first chart summarizes how Komen spent the $389.3M it received in Total Public Support and Other Revenue (“revenue”). As in previous years, Education received the highest allocation of $140.8M or 37% of revenue; Research $75.4M / 19%; Screening $46.8M / 12%; Treatment $20.1M / 5%; Race for the Cure and Other Fundraising Expenses were $36.1M / 9%. The remainder was spent on Affiliate Relationsand Other Administrative Expenses of $40.6M / 10% and increase to Assets of $29.3M / 8%. The second chart, compares the results of 2010 in total dollars to all prior years for which financial statements are available from Komen’s website. Once again I have to question the level of Komen’s investment in it’s Research program. In 2009 the Research program received $70.1M or 21% of total revenue, and in 2010 it received $75.4M which, although a slight increase in terms of dollars, only represents 19% of total revenue. As this third chart shows, relative to dollars earned, allocations to the Research program (purple line) seem to be on a definite downward trend, whilst the other programs remain fairly flat, and Administrative Expenses (orange line) seem to be on the increase. Analyzing further the financials for Komen’s Research program, I find that from the $75.4M allocated to the Research program, that only $62.7M was spent on actual research awards and grants with the remaining $12.7M spent on Professional Fees expense of $6.3M; Salaries and Benefits of $2.8M; and other Operating expenses of $3.6M. To recap; although the Research program was allocated 19% of total revenue only 16% of total revenue was used to fund actual research! And why the need to spend $6.3M on Professional Fees expense, which is generally fees like accounting, legal, public relations, financial management etc.? 16% to Research is significantly less than the 25% Komen repeatedly claims is used to fund research. And the annual Research program allocation percentage, when compared to total revenue, keeps decreasing! These types of line-item expenses buried within all of Komen’s Program allocations are not captured in detail in the high-level “Program Expenses” as reported by Charity Navigator. Although it is feasible that charities do incur expenses directly attributable to their Programs, and are correctly reported under each Program budget allocation, Charity Navigator’s ratings make no judgements as to whether such expenses buried within the Program Allocations, are in fact reasonable. 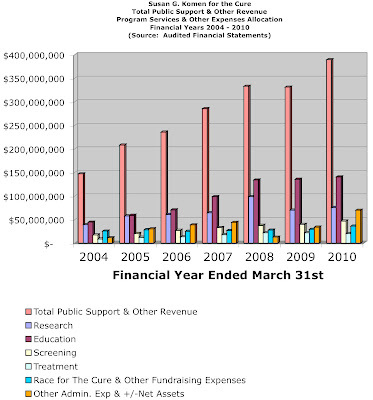 If all Administrative Expenses and Changes to Assets were tabulated, regardless of the Program budget to which they related to, for 2010 actual awards and grants across the Research, Education, Screening and Treatment Programs accounted for 40% or $156M of total revenue of $389M. The remaining 60% of revenue or $233M was spent on Administrative Expenses (about 18% for General Overhead and Increases to Assets, and about 42% attributable to Program Expenses). Again I ask, is this reasonable? What do we have to compare to? Perhaps this is another criteria for Charity Navigator to consider when establishing their new ratings system. How do the level of administrative expenses buried within Komen’s Program allocations compare to other similar charities? How much does it cost to run a Research Program? An Education Program? How much is Komen doing in-house? How much are they out-sourcing? Until we understand the answers to these and other questions, a four-star rating doesn’t mean much in my opinion. How can Komen continue to justify it’s position on Research and honestly think that it’s living up to it’s mission of “saving lives and ending breast cancer forever”? From its financials, its mission seems to shout Education. Not curing breast cancer. Are Komen really being “responsible stewards” of their contributors money? Has Komen been “effective” in the way it has spent the estimated $2Billion it has raised since 1982? NO. Following a career spanning fifteen years in public accounting and tax consulting, Anna Rachnel is now a full-time blogger. In her main blog, The Cancer Culture Chronicles, Anna writes about her personal experiences as a woman living with metastatic breast cancer, her observations of the surrounding breast cancer culture, as well as other important issues relevant to the breast cancer community. She also writes a magazine-style women’s interest blog at Can-Do Women. Hailing from Australia originally, Anna holds an Australian Bachelor’s degree in Accounting, and Masters’ degrees in Business Administration and Science from an American university. She is forty years old and lives in coastal New Jersey with her husband and small dog. Thanks for the repost Gayle. The numbers really continue to astound me. And I agree with your comment on my blog, that some of the research that Komen continues to fund in is, indeed, worthy. But how can they continue to justify allocating almost double the amount to education as a priority over research? $146M to education in one year???? And why does the research allocation % appear to be on a downward trend? If only Charity Navigator could answer some of these questions in their evaluation system. An independent arbiter is certainly needed in this case because we have so little to compare to. In essence, Komen can spend whatever they like on anything, and we the public, have no tangible way of evaluating the reasonableness of their fiscal decisions, except what we can deduce from their published financial reports. And if you don’t have a business analytic background, good luck with that! Rest assured, until I see more transparency and accountability from this organization as to how they are justifying their position on Research funding, in light of their stated mission to “end breast cancer forever”, I will continue to ask deeper questions. As everybody should be doing. Wow, you caught this one early. Now they are exposed as a right wing shill and baldly lying about it. Sounds like money could be better invested elsewhere and that this org got bloated, inefficient and needlessly political. Thanks for providing some lucid analysis of this organization. I’ve felt for some time that Komen has failed to live up to their mission statement. But, even more enlightening is your assessment of Charity Navigator. There, we look to see how well a charity is performing and instead come away with meaningless fluff! If folks will simply ask questions, read this type of blog, and view the documentaries on PBS, many of these charity “corporation” failings will come to light. The very worst to reconcile is the Haiti earthquake relief and abject failure to coordinate efforts. Thanks for your report. Need to know a few more things: Who is on the Board of Directors of Charity Navigator? Any conflicts of interests there? If the figures I read in current articles show “Education”, “Research”,”Screening”, “Treatment”, and “Other Fundraising Expenses”, may I be so bold as to ask the following: Which category does “Lobbying” come out of, and how much is spent on lobbying? Regarding “Treatment” – just who is getting the “treatment”? If research is dropping, WHY?? This is intrinsic in finding the cures they so boldly promise in their “Race for the Cure”. Where do the legal fees for trying to stop small groups (even ones who do not use the ‘for the cure’ slogan) get allocated for audit? And, does “Education” cover the pink buckets of Kentucky Fried Chicken and the new perfume manufacturing? If not, how is this handled, in addition to “corporate support”? Likely I can think of MANY more questions; anyone got any answers?